This proclamation allows the use of gill nets with a stretched mesh length of seven (7) inches and greater in the Atlantic Ocean for the striped bass and monkfish gill net fisheries only, while reducing interactions with marine mammals, sea turtles and sturgeon, from 12:01 A.M., Saturday, December 16, 2017 through midnight, Saturday, April 14, 2018. 1. During seasons established by proclamation for the harvest of striped bass from the Atlantic Ocean with gill nets. 2. During seasons established by proclamation for the harvest of monkfish from the Atlantic Ocean with gill nets in a one-mile-wide area extending from two miles seaward of the coastline to three miles seaward of the coastline from the North Carolina/Virginia state line southward to Wimble Shoal (Latitude 35° 30’N). B. It is unlawful to fail to fish large mesh gill nets set under the exceptions listed above at least once every 48 hours, weather permitting. A. This proclamation is issued under the authority of N.C.G.S. 113-170.4; 113-170.5; 113-182; 113-221.1; 143B-289.52 and N.C. Marine Fisheries Commission Rules 15A NCAC 03H .0103 and 03J .0103. C. Seasons and areas opened under the exemptions in I. A. and B. above may be closed or modified by proclamation if reliable Sea Surface Temperature data indicates that water temperatures are greater than 11° C or when interactions occur between large mesh gill nets and marine mammals, sea turtles or sturgeon. D. The intent of this proclamation is to allow traditional large mesh gill net fisheries for striped bass and monkfish to be pursued in state waters while reducing interactions with marine mammals, sea turtles or sturgeon. The Atlantic Ocean is closed to the use of gill nets greater than seven (7) inches from April 15 through December 15 by N.C. Marine Fisheries Commission Rule 15A NCAC 03J .0202 (7). E. The NMFS Bottlenose Dolphin Take Reduction Plan prohibits the use of gill nets, greater than or equal to seven (7) inch stretched mesh, at night from December 16 through April 14, unless tie downs are used from the NC/VA border (36° 33’ N) to Cape Lookout (34° 35.4’N). Tie-downs shall be spaced not more than 15 feet apart along the float line, not more than 48 inches in length from the point where it connects to the float line to the point where it connects to the lead line. Night is any time one hour after sunset and one hour prior to sunrise. 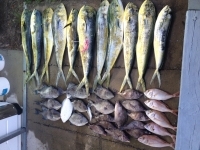 F. In accordance with N.C. General Statute 113-221.1(c) All persons who may be affected by proclamations issued by the Fisheries Director are under a duty to keep themselves informed of current proclamations. G. Contact N.C. Division of Marine Fisheries, P.O. Box 769, Morehead City, NC 28557 252-726-7021 or 800-682-2632 for more information or visit the division website at http://ncmarinefisheries.net/. H. This proclamation allows the use of gill nets with a stretched mesh length of seven (7) inches and greater in the Atlantic Ocean for the striped bass and monkfish gill net fisheries only, while reducing interactions with marine mammals, sea turtles and sturgeon, from 12:01 A.M., Saturday, December 16, 2017 through midnight, Saturday, April 14, 2018.